A few minutes conversation with educator Barbara Barnes and one soon realizes she is much like the heroine in Barbara Taylor Bradford’s well-read novel, “A Woman of Substance.” In her seven plus decades she has worn and is still wearing many hats … wife, mother, grandmother, educator, consultant and volunteer. And all are worn with humility, boundless energy and enthusiasm. Plus a fiery passion for what she does evidenced in a mischievous grin and sapphire blue eyes that light up her face as she speaks. Growing up in an era when professional choices for women were very limited, Barbara Barnes was born in Petersburg, IL, next to New Salem State Park where Abraham Lincoln once lived. Like many of her generation she was encouraged to become either a nurse or a teacher, so she entered Millikin University in Decatur, IL as a music major, switching to elementary education because she could easily incorporate her passion for music into a teaching career. Relocating to California, she began teaching in the Cupertino School District, where she had opportunity to become a principal when her principal encouraged her to get an MA in administration. Upon obtaining her higher degree from San Jose State University, she was hired immediately, and that beginning catapulted Barbara’s life into a whirlwind of extraordinary experiences and accomplishments that continue evolving today. After spending 10 years as a teacher and reading specialist, and 14 years as a school principal, Barnes became the Director of Business Partnerships in the Irvine Unified School District. Taking an early retirement she soon began forming partnerships of her own, collaborating with educators, business leaders and the community, she was instrumental in the transformation of poor performing, inner city and multi-racial, low socio-economic schools. This work addressing the needs of often neglected students eventually took her on the road, and she found herself traveling to a multi-racial, 17-language school in Bellflower, CA, a Vietnamese school in Sacramento, CA, and an African American school in Chattanooga, TN, among many others. Using those experiences and the same strategies applied in those endeavors, Barbara began developing professional training programs with Southern California’s UCI and Chapman, as well as Universities in Tennessee, Virginia, Idaho, North Florida and even England. Recalling some of her most extraordinary experiences, Barbara speaks of an encounter in a primarily Hispanic school in Tucson, AZ, where educators, parents and students discovered several cowboy and Native American artifacts while cleaning up a vacant lot next to the schoolyard. “It was amazing,” she exclaimed, an awe for the event evidenced in her thoughtful facial expression. “Everyone got so excited about their finds they decided to build a museum to house them, and with donations from several businesses they were able to historically restore an old structure for displaying their discoveries. It was quite an accomplishment and a great learning experience for all involved.” Another of Barbara Barnes’ adventures included a trek into the Alaskan bush. She tells of being approached by a school superintendent while presenting at a teacher training conference in Arizona. A couple of weeks later the call came through. The grant was in place, and Barnes was asked to come. It was then that she discovered the school was in Akiachak, Alaska in a remote area that required travel by passenger plane to Anchorage, cargo plane to Bethel and bush plane to Akiachak. And if that wasn’t surprising enough, once there she discovered that due to the deep snowfalls in the area the entire school was on stilts, with walkways high above ground between her module living quarters and the school. These and many other school transformation experiences have been shared by Barbara at the World Conference on Education For All, the National Symposium on Partnerships in Educations in Washington, D.C., the International Partnership Network conferences in England, France, Canada and Norway, the New Business Initiatives in Education Conference in New York, the National School Boards Conference, as well as the New Zealand Principal’s Conference. But … the accomplishments of Barbara Barnes don’t end there. A part of the San Clemente community since 1997, she came to town to be near her children, and because she loved living near the beach. And in late August of that year, although technically retired from principalship, she was hired as principal of the San Onofre School, located on the Camp Pendleton Marine Corps Base … a position she remained in for the next four years. The teachers were skeptical of Barbara’s idea as they were of the opinion that the town didn’t care about or even know about their school, and they thought that no one would help with such a big undertaking. But Barbara proved them wrong. On her own, she secured the help of the San Clemente Kiwanis Club (who donated money), Sonny’s and Carbonara’s restaurants, Billy’s Delicatessen, Wal Mart, Costco and Coca Cola (all who generously provided food, paper goods, and drinks). She also garnered volunteers to set-up, serve and clean-up from among the members of the San Clemente Presbyterian Church. With all this help, the Family Dinner was a big success, serving over 500 marines and their families, and since that first beginning, the school has held five more of these popular gatherings. Staying true to her personal values, in another incident as principal Barbara decided the school should have a monthly Flag Ceremony. When the Marine Chaplain heard about it he asked if he could come and say a prayer for the Flag and for the Marines. Barnes’ response was, “absolutely.” A few weeks later she got a call from a Fallbrook School District administrator who was concerned that she had said a prayer at school. Her answer was, “No, the Chaplain said a prayer and we’re on Federal property.” And that ended the concern. While acting as principal at the school, Barbara Barnes also instituted an after school intervention and enrichment program for all students entitled Terrific Tuesday. Upon retiring - once again - she formalized this mentoring and afterschool club program as part of the San Clemente Presbyterian Church Learning Center. Volunteers from SCPC, Our Lady of Fatima and the community now help San Onofre elementary and middle school students on the base to complete homework and master skills. These volunteers also lead the guitar, quilting and art club. As a result of the success of the San Onofre program, SCPC Learning Center has expanded to include four afternoons each week at Marblehead, Las Palmas, Shorecliffs and Bernice Ayer Schools in town. Through these free programs students are significantly improving their skills, and Bernice Ayer and San Onofre featured this afterschool program in their California Distinguished Schools Designation. Currently Barbara Barnes serves as an elder at SCPC, sits on the Advisory Board of the Crystal Cove Alliance at Crystal Cove State Park, the UCI Department of Education Chair’s Advisory Board and the Advisory Committee of the Irvine Ranch Outdoor Education Center. 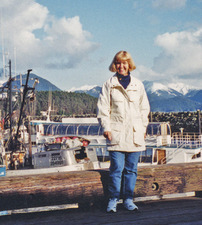 And when she isn’t busy interacting with her three sons and having fun with her four grandchildren, in her spare time, she indulges in traveling, photography; collecting antiques and Lincoln memorabilia, and researching ancestral and WWII history (her dad was in the Battle of the Bulge). 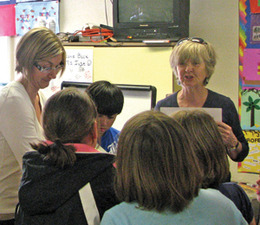 Due to lack of funding more tutors, mentors and club leaders are needed for the 2010/2011 school year. If you would like to join this dedicated group of fun people helping San Clemente and Camp Pendleton students, or make a contribution to the after school programs please email barbarabarnes@cox.net or speak with Kelly at the San Clemente Presbyterian Church. Places, Community san clemente presbyterian church.